I didn’t think it was possible, but on this trip, we actually doubled our luggage and tripled our overweight bag fee. After having spent two weeks settling into our Oslo place, I’d accumulated a list of things that I needed to carry back from the U.S. These must-have items included financial files, computers, our Sonos system, rugs (to muffle the echo of our new cathedral ceilings), and other household items that were simply too pricey to purchase in Oslo. The trip to the airport was a bit harrowing this time. Although we’d ordered a van, a small town car showed up. Frantically we had the driver call another cab — an SUV — and we filled both vehicles to the gills with boxes, hockey bags, suitcases, and cat carriers. We arrived late for our flight, and in all the rush of loading everything onto trolleys, we somehow left one hockey bag in the town car. Fortunately the driver realized what had happened and came running after us while we were at the baggage counter. Our poor kitties, who’ve never left the house except to visit the vet, were completely freaked out by all the noise at the airport and shrank quivering in the back of their carriers. After the first leg of the journey to Newark, we realized that they’d need a quiet nook in which to spend the three-hour layover, so we headed for the United Airlines lounge. Free beer, wine, snacks, and cushy chairs greeted us, and we settled in for the long haul. We spent the first hour talking to a lovely lady, a professional Marijuana trimmer (never knew this was a viable profession), who was on her way to harvest some plants at a medical grower’s in Seattle. The three of us traded notes on our favorite southwestern city (Tucson), until it was time for a kitty bathroom break. Now mind you, I’d come prepared as prescribed by the vet: a collapsible litter box, a bag full of slightly used litter for encouragement, and cans of wet food for a job well done. We were fortunate enough to find an empty handicap single bathroom, so we locked ourselves in, released the panthers, and crossed our fingers. No such luck. They looked at us like: “Seriously?” Two more attempts during the next two hours produced only moderate results, with just one kitty obligingly taking a leak. 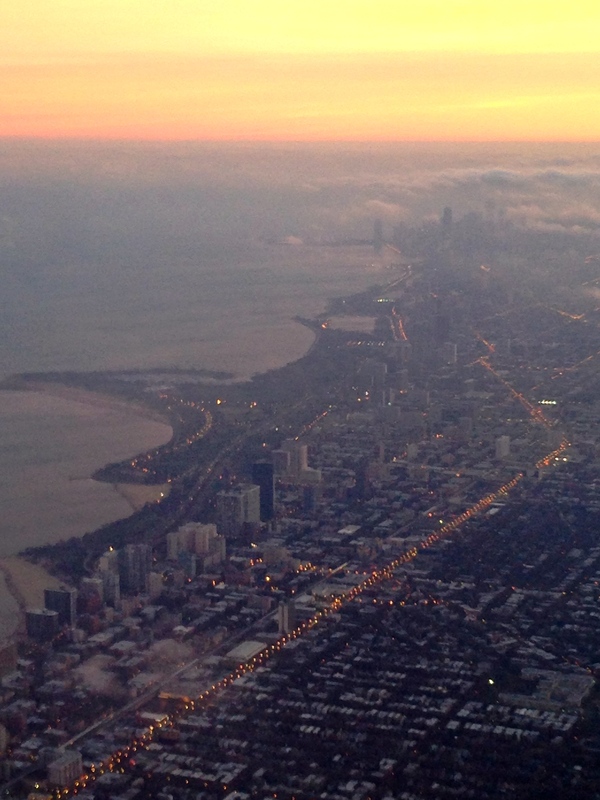 Considering the long seven-hour flight ahead of us, I began to get really nervous. We eventually boarded the plane and stuffed the kitties under our seats. But shortly after dinner, things got rough. The unfortunate man behind us had epilepsy, so several times during the long flight he endured grand mal seizures that caused him to yell, thrash, and kick the back of our seats. By the end of the flight, all of us — the poor guy, the kitties, and Matthew and I — were all limp dishrags, never happier to set our feet on solid ground. Two trips to the bathroom with the kitties during the flight had been mildly hilarious but surprisingly unprofitable given the unsettling situation, so we were eager to get them home before their bladders burst. But our final hurdle was to pass the health examination by the airport vet — an appointment that Norwegian requirements dictate cannot be set up until the day before the flight. A jovial man resembling a nisse (Christmas elf) in his traditional Norwegian sweater carefully reviewed our pet passport, examined the kitties, and welcomed us into the country. With a cheery wave, he wished us a God Jul and a Merry Christmas, and we heaved a sigh of relief that we’d officially completed the last leg of our journey. After claiming our copious luggage, we headed to the taxi stand. This time we ordered a car for eight people … and an actual tour bus showed up. The kind that rock bands travel across the country in. Although I was glad for the packing space, I can’t tell you how ridiculous we felt riding around in vehicle meant for 30. It was so cushy, however, that Matthew fell asleep and missed all the misty, snow-covered scenery. The thick fog gave the entire landscape a dreamy, Monet-like quality, and I decided winter might not be so scary here after all. Arriving at our Oslo place, we dashed the kitties upstairs and placed them in the bathroom with their litter boxes in hopes that they’d calm down and do their business while we unloaded. No need to have worried. 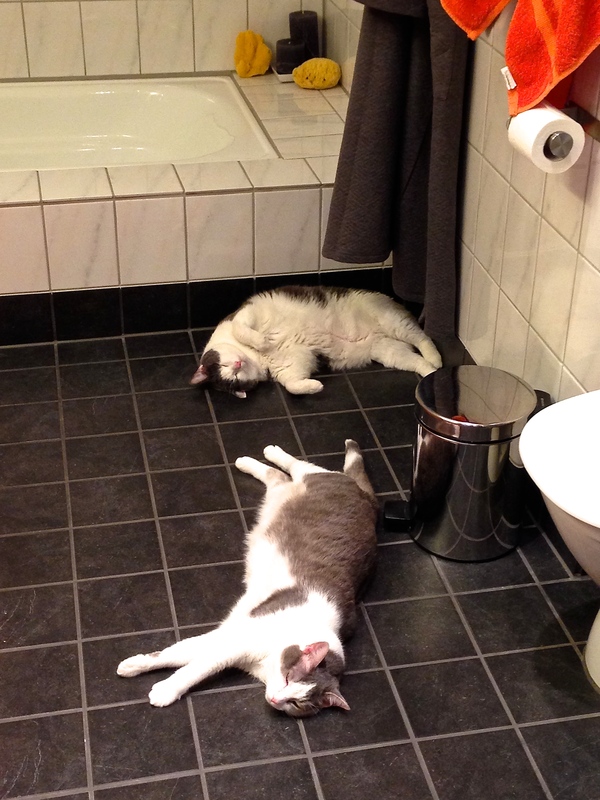 After our 25 trips up and down the stairs, we opened the bathroom door to find the litter box full and the kitties cashed out in a purringly drunken stupor on the heated bathroom floors.